Ely, MN--Several Fellow Travelers have canoed Minnesota’s Boundary Waters Canoe Area in the past. Keith Webb has made several trips. For 2008 he invited eight other male members of the extended family for a paddle beginning on July 13 and extending to July 18. 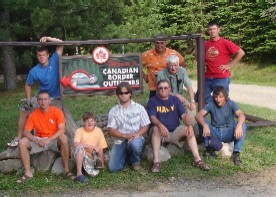 Keith arranged the trip and made all the preparations through Canadian Border Outfitters of Ely. Charlie Stines flew from Tallahassee to Minneapolis where he was to meet the others at 10:30 AM on Saturday. Keith Webb, Byron Webb, Todd Webb, Donald Webb, Kyle Griffin, Calvin Stines, and Noah Stines set out from North Carolina on Friday in a 1979 Dodge motorhome given to Calvin by his father-in-law, Buster Price, and affectionately named the Bustermobile. After three blowouts, a loose alternator, and a broken fanbelt the Bustermobile arrived at the Minneapolis airport around 5:30 PM. Charlie climbed aboard and the trek to Ely was underway. It was a long drive from Minneapolis to Ely. The clan stopped at Culver’s north of St. Paul for a meal served by a cutie named Katie. Todd asked her to come along but she said she had to play socca. Then it was driving on to the outfitters until about 3 AM Sunday morning. Upon arrival some stayed in the bunkhouse and so me slept in the Bustermobile. The weather was cold and damp. The outfitters served a good meal of hotcakes, bacon, juice, and coffee. The waitress had never heard of grits. After breakfast and a visit to pay fees and buy fishing licenses the nine prepared for the put-in. Todd insulted one of the ladies at the outfitters by asking her if she shaved. The canoes were loaded on to motorboats and the outfitter then motored everyone for about an hour across Moose Lake to the put-in. The trip to the put-in was through choppy waters and through drizzling rain. The temperature was unpleasantly cool. Keith had told everyone to bring a warm jacket and that was good advice. 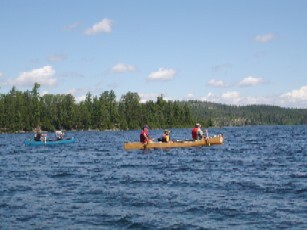 Once at the put-in the canoes were unloaded and portaged a short distance to Birch Lake. Birch Lake is also a big lake and it was a tough paddle against a headwind in very choppy water. The scenery was outstanding. The shoreline of all the lakes are lined with several v arieties of evergreens and hardwoods with the white birch bark making the tree line especially pretty. 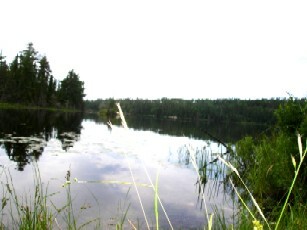 The paddle across Birch Lake ended at the portage to Carp Lake, another large lake. There was a 660 foot portage to Carp Lake. Although the lake is very big the route to the next portage was reasonably short. The portage across to Melon Lake was a little over 400 feet. Melon Lake is a small lake with a rocky shoreline lined by trees. Several loons swam in the water. After the short paddle across Melon Lake there was another portage of about 400 feet to Seed Lake. 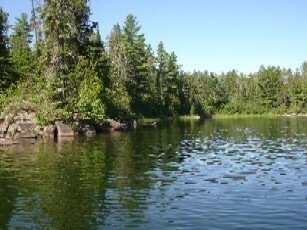 Seed Lake is somewhat larger than Melon but is still small by Boundary Waters standards. 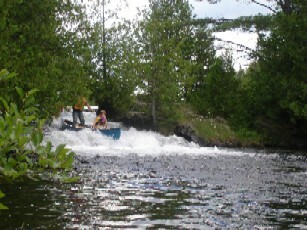 There was a real rapid at the end of Melon Lake where Seed Lake falls into the Melon Lake. It was time for snacks by the time the portage out of Seed Lake into Knife Lake. Once the men had eaten it was time for a really long portage of over 1200 feet into Knife Lake. The waterway connecting Seed and Knife was tame enough that Kyle elected to wade and pull a canoe rather than carry all the gear. Keith had brought three canoes and all were heavy--a battle-scarred 17’ Alumacraft and two Old Town Discovery 158 canoes. Each weighed about 80 pounds. He also rented a nice Wenonah Minnesota 3 Kevlar canoe so that three could ride together. The Wenonah weighed around 50 pounds. The portage into Knife Lake was the last one for Sunday. Knife Lake is enormous and the wind really created unsettling waves. The designated campsites are plentiful. Each is equipped with a fire grill and a latrine. Campsites are not assigned. The original plan was to camp at the west end of Robbins Island but that campsite was taken so the weary paddlers made their way to the east end of the island and found a really good one. The view of the lake was obscured by the trees but it was high and shaded. Elderberries were ripe and a few were eaten. Some of the men erected a tarp to serve as a rain fly and then everyone pitched tents. Ray Dean and Todd went out for a short canoe ride in one canoe and came back with two. 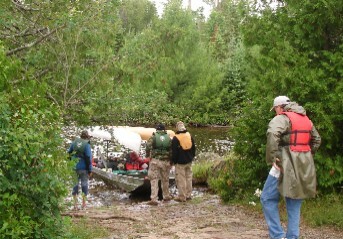 They found a sunked Kevlar Souris River Quetico 17 and hauled it back. It made the ghost boat find on the Shoal seem like a minor story. Everyone was excited that Ray Dean would have a $3000 canoe for free. It obviously had been lost by someone who had rented it from Northwest Voyagers Outfitters because Keith and Ray Dean went back to the scene and found a couple of bent shaft Sawyer paddles and a cushion with the outfitter’s name. Nevertheless, all the men agreed that the unfortunate boat renter had already had the canoe charged to his credit card and the outfitter had been paid. By all rights it seemed that it s hould be Ray Dean’s canoe. 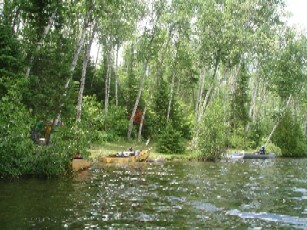 The group used the 44 pound canoe for the rest of the journey and let the the Alumacraft take a nap. After gathering firewood it was time for supper. Keith (named the Dictator by Ray Dean) cooked hobo meals in tin-foil. The beef, carrots, onion, and potatoes were cooked just right for the hungry mob. Noah proved to be handy at keeping the firewood cut. The fire was a welcome thing because the temperature was still on the cold side of cool and the rain came with a vengeance. After telling lies and making plans for the day it was time for bed. Once in bed the rains became heavier. Ray Dean, Todd, Donald, and Charlie shared a four-man (barely) tent and it leaked so badly that Ray Dean and Todd left for shelter under the tarp. Byron slept in a hammock. Keith used a bivy. Calvin, Noah, and Kyle shared a tent which they had wisely pitched under the tarp. Keith prepared breakfast of bacon, grits, and eggs. Ray Dean had thoughtfully brought along two gallons of milk. Charlie washed the dishes and then it was off to fish. Monday’s fishing was done on Knife Lake. Everyone caught some, even Charlie. The fish were all small mouth bass. Charlie hooked a large northern pike but i t broke the line and got away. After lunch there was some more fishing. Kyle, Noah, Todd, Byron, and Donald gathered wood for the night’s fire. Calvin fileted the fish and Keith fried them. He also had salad and made some hushpuppies using a Martha White mix which the King complained about having sugar in cornbread. It rained again Monday night. Ray Dean moved the tent under the tarp and everyone stayed reasonably dry. Charlie got up early on Tuesday and got the fire going. The temperature had warmed considerably and the sky was blue. The water had calmed. After devouring Keith’s breakfast some went fishing and others hung around the campsite. The campers went to Spoon Lake by way of Bonnie Lake, both involving some good portages. Ray Dean taught Calvin how to fish. They brought back a large catch of northern pike. Later in the day Ray Dean, Kyle, Keith, and Charlie canoed over to the Canadian side and hiked to Crawford Lake to pick blueberries. Most were not ripe but there were enough to be used for the next breakfast pancakes. 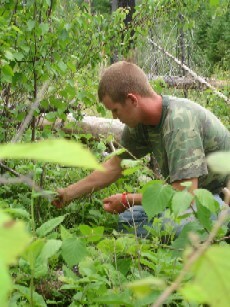 The wild strawberries and raspberries were also ripe. Kyle took a swim in the lake. C alvin again prepared the fish for Keith to cook. Keith cooked the pike in tinfoil on the grill. Most agreed that the bass made a better meal and had fewer bones. Keith also prepared a peach cobbler in the Dutch oven. Wednesday night was spared rain. The travelers sat around the fire telling stories and swatting flies. The best one was about W.H. fatally wrestling the neighbor’s young bull. Calvin also told about being out in the Florida swamps and hearing Sasquatch. He became frightened but could not get away from the noise. Finally he found a back gate to Sea World and discovered that the Sasquatch sound was merely a concert at Sea World. Calvin did not know which group was singing. After breakfast on Thursday Ray Dean, Keith, and Donald decided to take a trip to Neglige Lake because they thought it was full of brook trout. If it was, it still is. They brought none home. To get there they had to do a 3300 foot portage to Missionary Lake and a couple more shorter ones. They came back a different route through Skoot a Lake and Dix Lake but still had to carry the canoes. Thursday afternoon a Canadian teacher dropped by for a visit and to eat his meal as the travelers ate theirs. His name was Glen Smith and he had been on the water for fifteen days in a beautiful cedar strip kayak he had hand crafted. Glen was looking for any remains of the cabin of the fabled root beer lady, Dorothy Molton, who lived on Isle of Pines near Robbins Island for about fifty years. Thursday night was again time for fried bass. There was a cherry pie baked in the Dutch oven for dessert. The threatened rains never came. Kyle and Noah had gathered firewood so the campfire was the center of all social activity. Friday morning Keith fixed instant oatmeal for breakfast. The campsite was cleared and the canoes packed. It was time for the long paddle back to meet the outfitter at the end of Birch Lake. The wind was not terrible even on the big lakes. Everyone canoed the small rapid into Seed Lake. Keith and Ray Dean decided to run the big rapid in the aluminum canoe and did so without capsizing. After that Kyle and Noah took the blue Discovery through it and did beautifully until Kyle decided to stand up in the canoe midway through the rapid. After that they portaged the canoe a couple of times so that Keith and Ray Dean could run it again and so that Kyle and Noah could. No one overturned. Kyle decided to swim across Seed Lake rather than ride the boat. The lunch stop on Melon Lake was a very nice break. The menu was whatever was left over eaten on tortilla bread--peanut butter, bacon, cheese. There were also some candy bars, cookies, Gorp, and other treats. Since there was an extra canoe, Charlie soloed a Discovery back. He was the cow’s tail but the group arrived at the portage to meet the outfitter slightly ahead of the 4:00 PM time. The outfitter was there to take everyone back to the bunkhouse for showers. After loading the canoes and packing the Bustermobile everyone was ready to head for Minneapolis with the idea of spending the night in a motel along the way. The outfitter really rained on the parade by informing Keith that the group could not take the Souris River canoe. Rather than argue salvage rights the canoe stayed. It was a long drive. Although the campers had seen lots of loons, ducks, bald eagles, and other birds they had not seen any deer, wolves, or moose. A wolf ran across the road as the Bustermobile left the outfitter outpost. The men ate a late supper at the Sawmill Grill and Saloon in Virginia, Minnesota and trekked on to Grand Rapids for a motel room which was located right beside the birthplace of Judy Garland. Saturday morning was more bad news for the Bustermobile. The alternator bolt had broken. Calvin had an easy-out and was able to remove the bolt. Charlie walked to Home Depot and found a replacement bolt and then there was a mad rush to the airport. Charlie barely made it in time to catch his flight. His trip home was uneventful but the other eight travelers in the Bustermobile stopped in Wisconsin to buy two more tires. They finally made it home just before dark on Sunday night.